Beyond the Frontlines to be screened in Austin, April 28, 2019. When: Saturday, April 13, 2019, 6:30 – 10:30 p.m.
Tickets: Tickets online at Ticketbud. 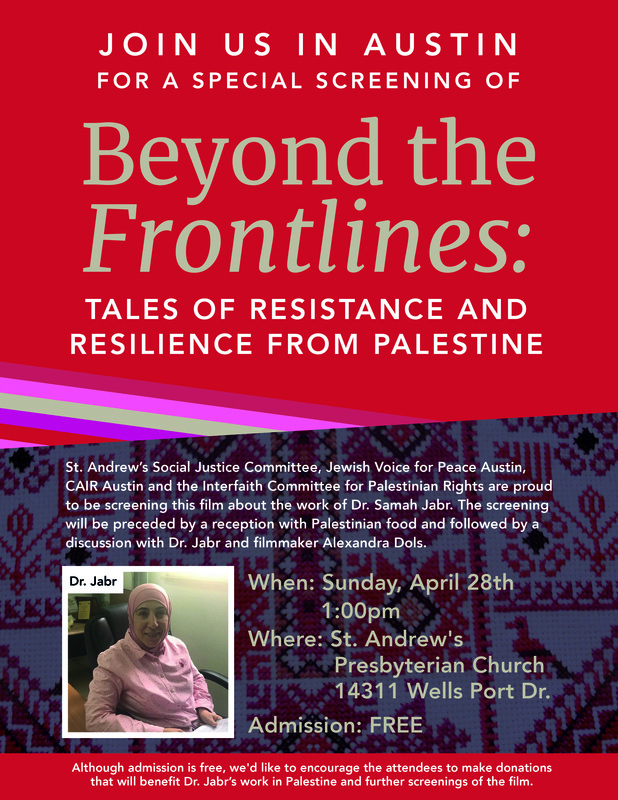 When: Sunday, April 28, 2019, 1:00 p.m.
AUSTIN — Two Austin events in April highlight the Palestinian cause. Open studio event on April 19 is sponsored by Austin’s Canopy and Big Medium groups. Art aficionados attend monthly open studio event. 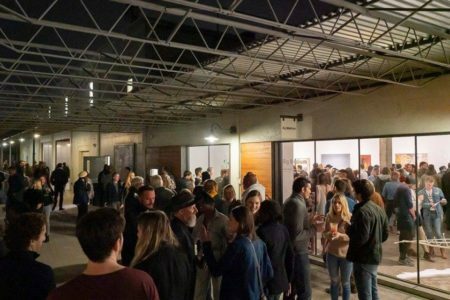 AUSTIN — Arts organizations Canopy and Big Medium are having their monthly open studio event –- known as Open Canopy — on Friday, April 19, from 7 pm to 10 pm. The event, which takes place at 916 Springdale Road, Austin, near the intersection with Airport Blvd., is free and open to the public. Artists Cecilia Colomé and Fernando Muñoz have invited Rag Blog readers to visit their studio in Building #1, Studio 105. Javier Jara, Sacred Cowgirls, Bird Casino, and Maracatú Texas will perform. When: Sunday, November 18, 2018, 6-11 p.m.
AUSTIN — The Austin chapter of Democratic Socialists of America (DSA) is hosting an event to raise bail and funds for immigrant women held at T. Don Hutto Detention Center in Taylor, Texas, on Sunday, November 18, 2018, . 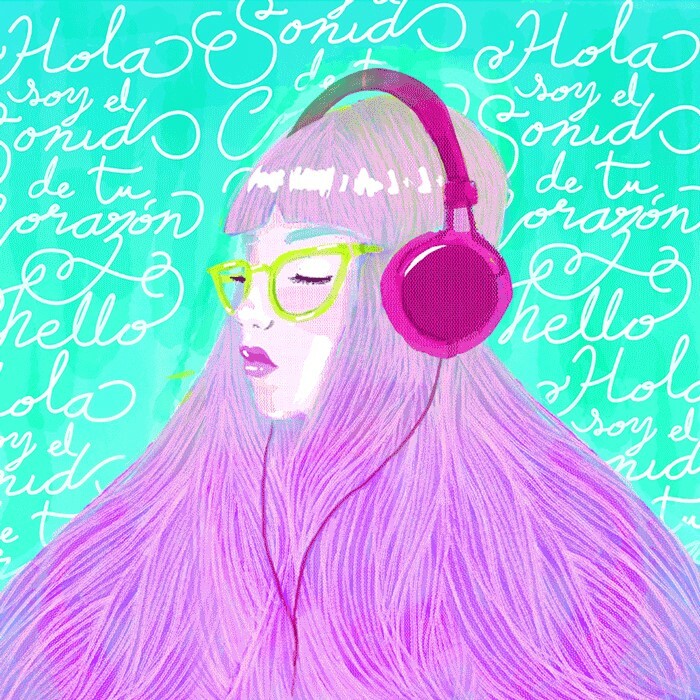 Music will be provided by Javier Jara, Sacred Cowgirls, Bird Casino and Maracatú Texas. Comedians Elizabeth Spears, Angelina Martin, and Melody Shifflet will also perform. 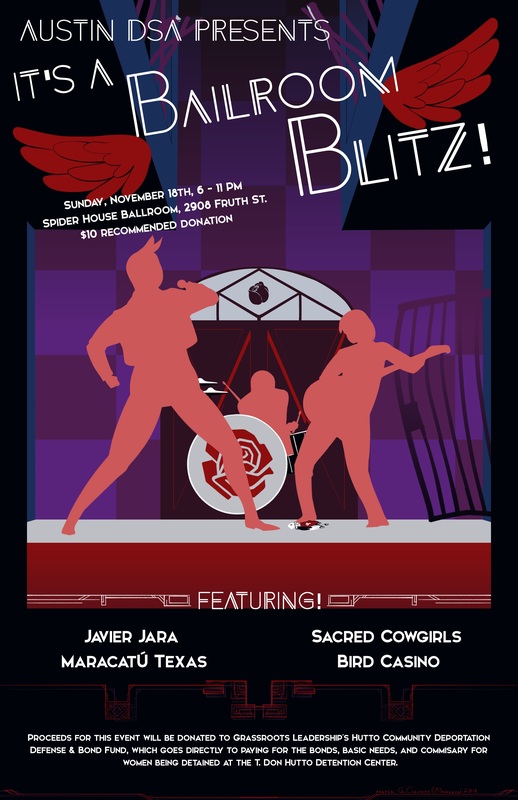 DSA Presents It’s a Bailroom Blitz at the Spider House Ballroom, 2908 Fruth Street in Austin, Texas. Benefit proceeds will be used to post bond for women incarcerated at the Hutto Detention Center so that they can pursue asylum claims. Both donations at the door and for merchandise will directly benefit the Hutto Community Deportation Defense and Bond Fund. For more information about the fund, or to make donations directly, visit the Grasssroots Leadership website. A former immigrant detainee will speak about her experience in detention and the support she has gotten. The goal of the benefit is to raise enough in donations to post bond for two women at T. Don Hutto. Historic Austin bands the Uranium Savages, Bill Kirchen, Shiva’s Headband, and Leeann Atherton will perform. When: Wednesday, August 1, 2018, 6:30-10:30 p.m. 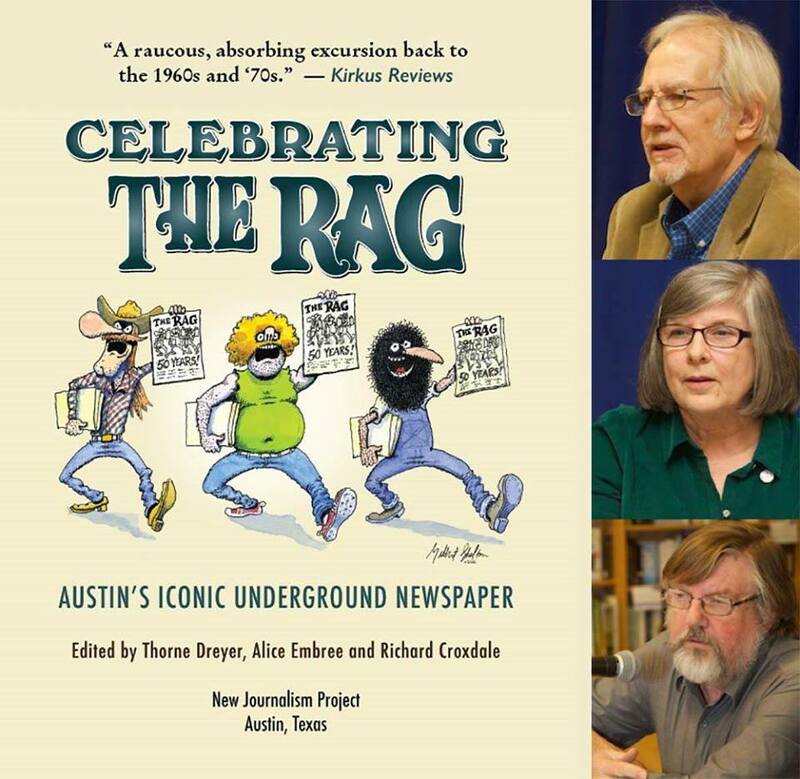 Proceeds to: New Journalism Project, Inc.
AUSTIN — Eddie Wilson and Threadgill’s are honoring longtime Austin progressive activist and journalist, Thorne Dreyer, on his birthday, Wednesday, August 1, 2018. 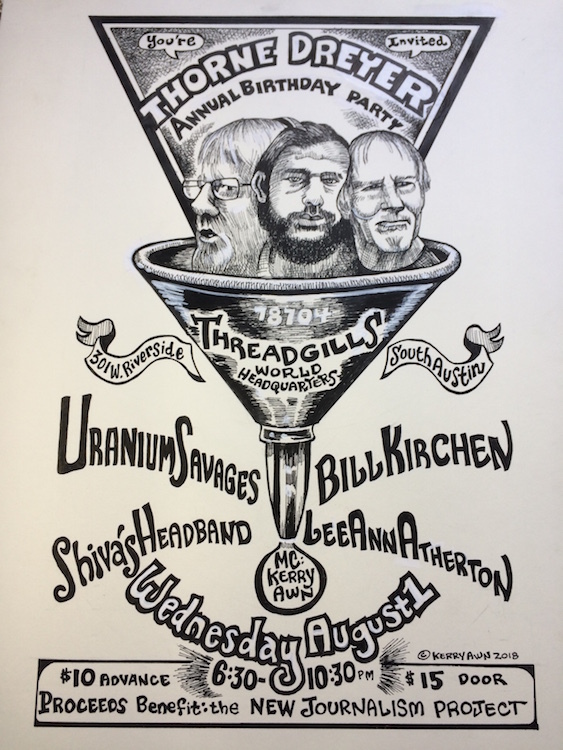 It’s Thorne Dreyer’s Birthday Party and the event features historic Austin bands Uranium Savages, Bill Kirchen, Shiva’s Headband, and Leeann Atherton. It’s all happening from 6:30-10:30 p.m. at Threadgill’s World Headquarters, 301 W. Riverside, Austin, TX 78704 on Wednesday, August 1. The Uranium Savages are Austin’s classic comedy-rockers; Guitar virtuoso Bill Kirchen sparked Commander Cody and his Lost Planet Airmen; Shiva’s Headband was Austin’s pioneering psychedelic blues band; and blues-rock songstress Leeann Atherton is a longtime fixture on the Austin scene. Charge: No admission; $10 donation to NJP optional. Amenities: Food, cash bar, rooftop deck. 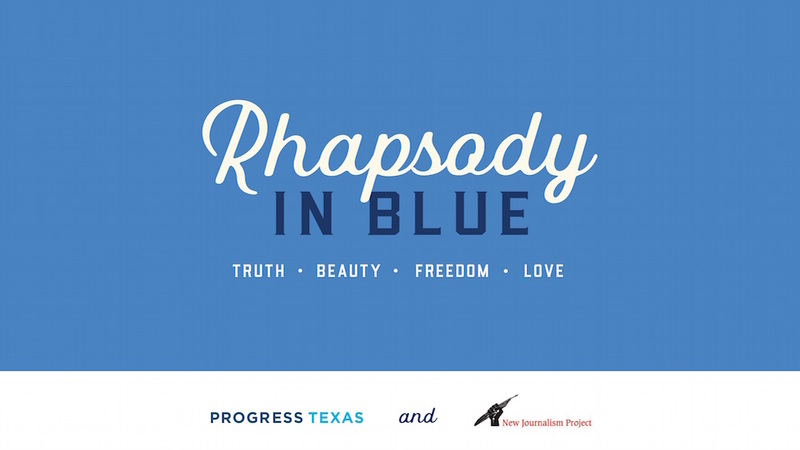 AUSTIN — Rhapsody in Blue (“Revelry for the Resistance’s Sake!”) is a celebration of music, poetry, storytelling and art with — and for — the Central Texas progressive community. 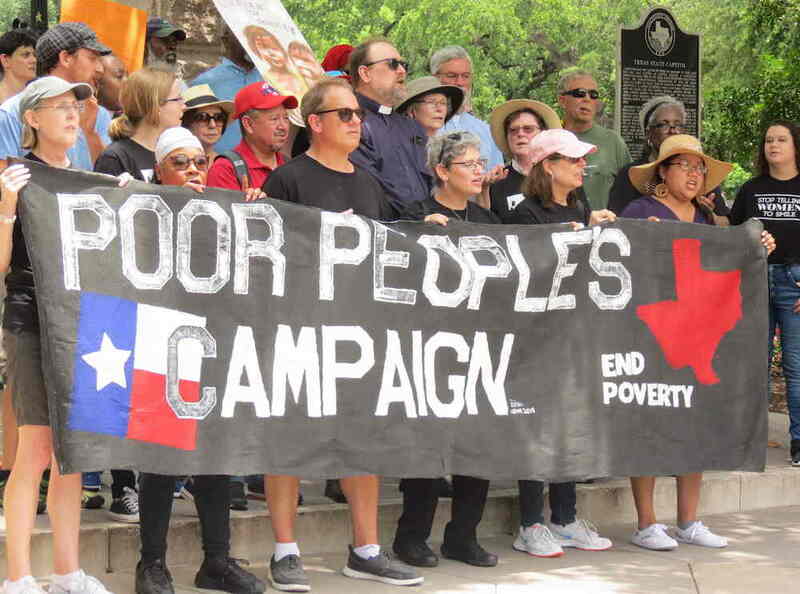 Jointly sponsored by PROGRESS TEXAS and the New Journalism Project, the event happens Thursday, May 10, from 7-9:30 p.m., at The High Road on Dawson, 700 Dawson Rd., Austin TX 78704. 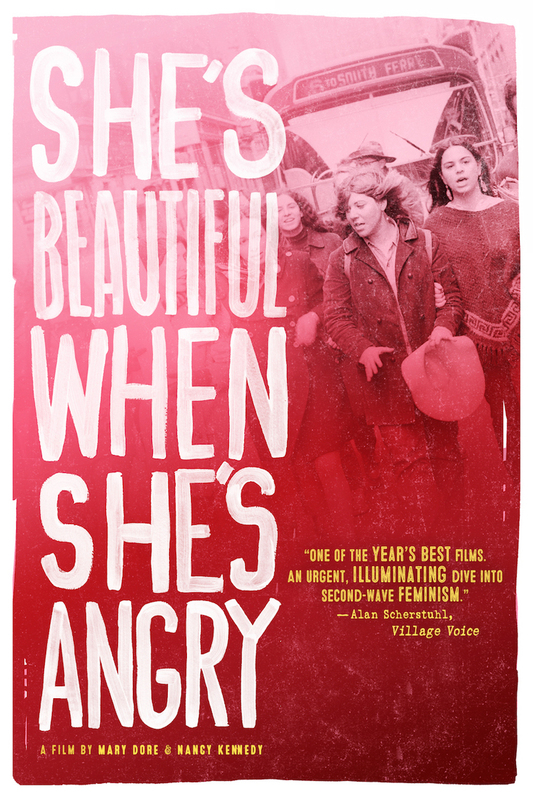 When: Tuesday, April 17, 2018, 7 p.m.
AUSTIN — On Tuesday, April 17, 2018, there will be a screening of Mary Dore and Nancy Kennedy’s documentary about the rise of the women’s movement in the United States between 1966 and 1971, She’s Beautiful When She’s Angry. 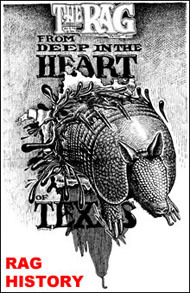 It will be shown at the Alamo Drafthouse Mueller, 1911 Aldrich Street, at 7 p.m. 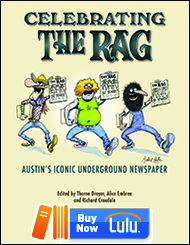 The film was highlighted on The Rag Blog when it premiered in Austin in 2015. When: Sunday, April 8, 2018, 6-10 p.m.
AUSTIN — Lucky Chaos is inviting the public to Our House: A Festival of Arts, Diversity & Community on Sunday, April 8, 2018, from 2-5 p.m., at the Motion Media Arts Center, 2200 Tillery in Austin. 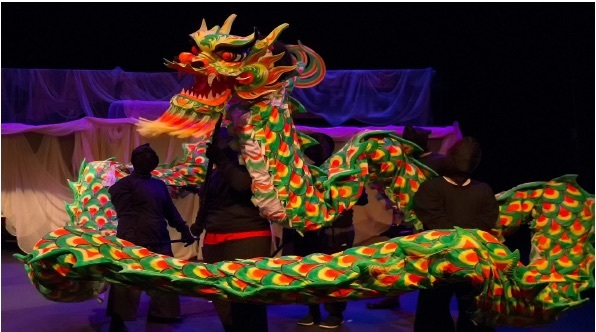 The highlight of the arts and cultural festival is the rarely performed “Dian Jing,” an “eye-dotting” awakening ceremony for the group’s 20-foot Chinese dragon. When: Thursday, March 8, 2018, 6-10 p.m.
AUSTIN — In celebration of International Women’s Day the Feminist Action Committee of Austin’s Democratic Socialists of America is putting on a Music Fest featuring bands and spoken word. A $10 donation is suggested and will benefit the Lilith Fund. This will be the third year that DSA socialist feminists have fundraised for the Lilith Fund, an organization that supports the right of all Texans to make their own reproductive choices, regardless of income. 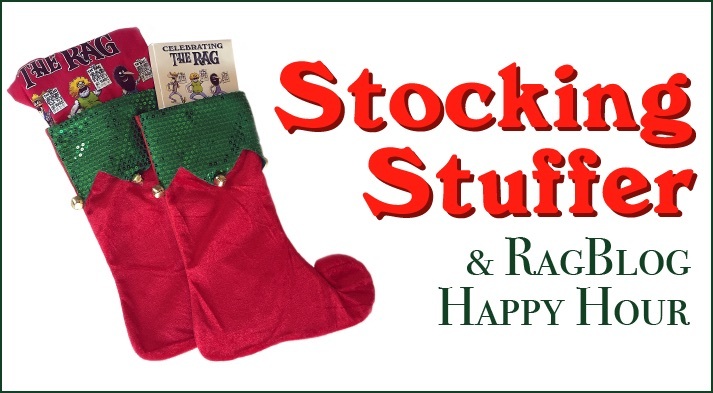 Event: Rag Blog Happy Hour & Stocking-Stuffer! When: Saturday, Dec. 16, 2017, 2-4 p.m.
Join us for an informal get-together sponsored by the New Journalism Project (The Rag Blog and Rag Radio) — and do your last-minute politically-correct X-Mas shopping — this Saturday at Ruby’s BBQ. 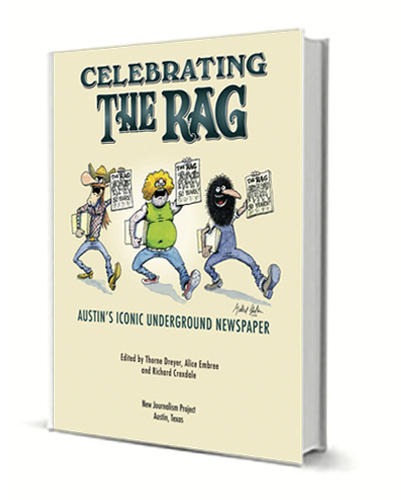 Get our critically-acclaimed book, Celebrating The Rag, at a special holiday discount — as well as Rag commemorative t-shirts — and choose from our great collection of classic Hawaiian shirts! 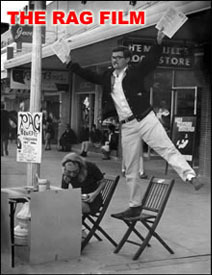 He opened the Methodist Student Center to an alternative view of the world during a period of tremendous upheaval. Rev. 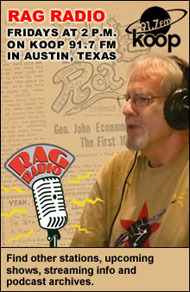 Bob Breihan on Rag Radio in the studios of KOOP-FM in Austin, Nov. 29, 2013. Photo by Roger Baker / The Rag Blog. 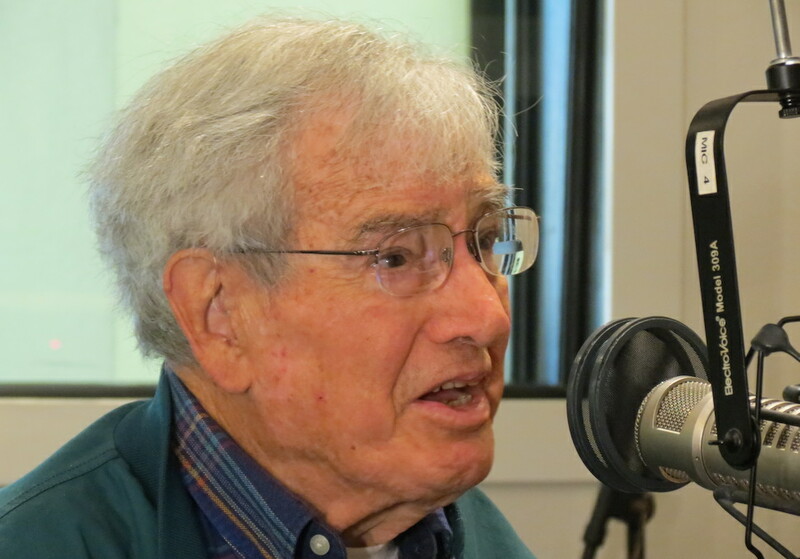 Listen to Thorne Dreyer‘s hour-long Nov. 29, 2013 Rag Radio interview with Rev. Bob Breihan, here. AUSTIN — Rev. Bob Breihan passed on, surrounded by loved ones, in his home in Austin, Texas, on November 4, 2017. He was 92. A celebration of his life will be held at 2 p.m., Saturday, November 18, 2017, at University United Methodist Church in Austin. In lieu of flowers, the family asks that donations be made in Bob Breihan’s name to University United Methodist Church, 2409 Guadalupe, Austin, Texas 78705; to the Southern Poverty Law Center, 400 Washington Avenue, Montgomery, Alabama 36104; or to a charity of your choice.